The first page of the team worksheet contains the summary statistics. When a web site is generated, this page serves as the framework for the team's home page. After the current won/lost/ties entries have been updated, the Calculate / Division Standings menu command will update the division standings area. An option exists to automatically update the Division Standings from the game scores in the Schedule as well. After player stats have been entered, a box score for a selected game can be generated via the Calculate / Box Score menu command. A snapshot of the top batting leaders in each selected category is displayed via the Calculate / Batting Leaders command. 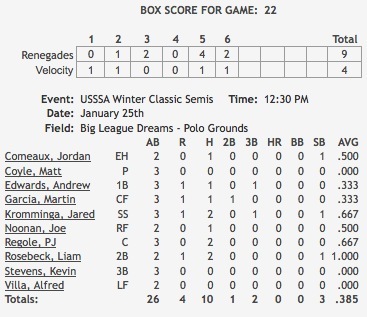 A box score for a selected game can be generated. First, the specifics for the selected game (e.g. : team names, date, time, location, etc.) and the line score for each team are entered. The SBC will calculate run totals for each team. The Calculate / Box Score menu command will extract key statistics for participants of the selected game and compose the box score. The players can be sorted either by position or alphabetically by name. The user may select the stats for two of the box score categories from BB, FC, ROE, HBP, SO, RBI, SF, SACB, or SB. In the example, FC and SF have been chosen. After the Box Score has been calculated, the line score and game specifics will be saved for future recall. The SBC will warn the user if the total runs scored in the line score does not match the total in the box score. When the Print command is executed, line/box scores for all games will be included. When a web site is produced via the One Step Web Site command, a separate web page is produced with a list of all of the games. 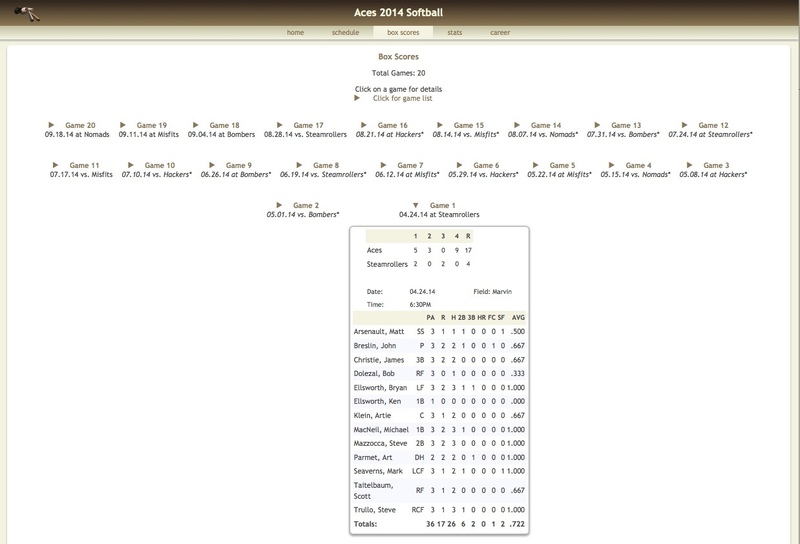 When the page is viewed in a browser, the user may click on any game in the list to view the line/box score. The order of games in the Box Score can be either ascending (first game played) or decending (most recent game first). 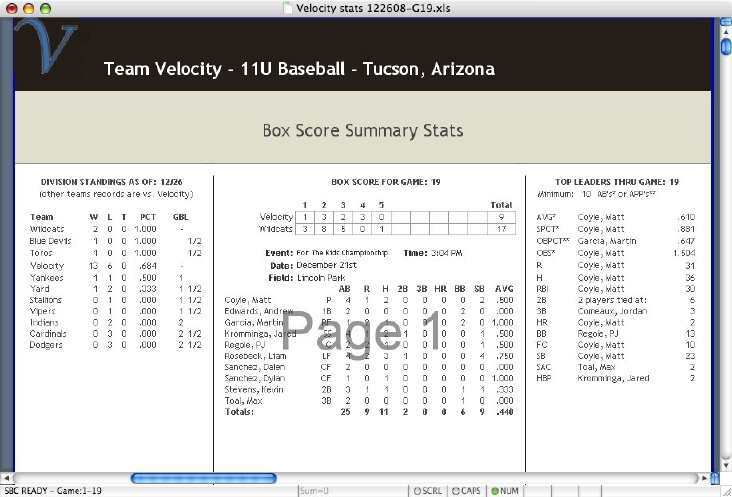 Game Line/Box Scores can be sequentially viewed by the Display / Next (Previous) Box Score command. The User Notes area is a separate page on the Team Worksheet. Some possible uses are for roster information, custom schedules, team or league-specific information, contact information, or just personal notes for the scorekeeper or team manager. The user has control over the content, format and whether this area is included in web sites and/or printed pages. When incorporated into a website, the title of the User Notes area can be defined as desired by the user. Hyperlinks to other content such as a league web site, calendar files, etc. may be incorporated as well.